New bridegroom Allu Arjun is on a sky high after marrying Sneha Reddy whom both he and his parents liked.Talking to the media for the first time after his wedding, Allu Arjun says he will do only two movies hereafter as it brings in quality and concentration. Bunny clarified that though Geeta Arts, his home production is producing ‘Badrinath’, it shouldn’t be compared to ‘Magadheera’ as they are two different genres all together. This movie is one of the highest budget films this year. “Movies like Magadheera come once in a decade. It is unfair to compare it with Badrinath. I will do only two films an year hereafter. Then I can focus on the script and the movies. Too many films will take away the concentration from them” he said. Talking about Sneha Reddy, he gets a little shy. He admitted that his wedding with Sneha Reddy was a love arranged marriage. 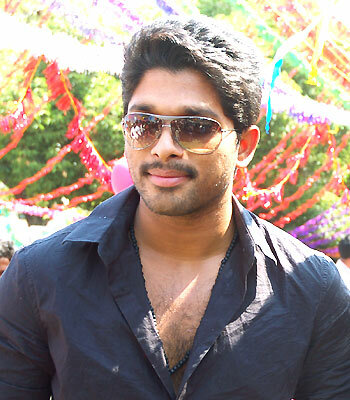 Bunny revealed how he saw Sneha at a wedding and fell in love with her after being introduced through a common friend. “Ours is a love arranged marriage. Gossips and rumours about us actually helped us both. I proposed to her and convinced their parents too” Bunny said.